Diplomat Song Tao is visiting the North on behalf of President Xi Jinping to brief officials on the recent Chinese Communist Party congress and other "issues of mutual interest", foreign ministry spokesman Geng Shuang said. Beijing: A top Chinese envoy landed in North Korea on Friday in a trip hailed as a "big move" by US President Donald Trump, who has urged Beijing to pile pressure on its nuclear-armed ally. He is the first major Chinese envoy to visit Pyongyang in more than a year with ties severely strained between the two countries. Analysts expect Song to address the nuclear standoff, which has roiled relations between the two Cold War-era allies as China has backed United Nations sanctions on North Korea over its missile tests and sixth nuclear blast. Trump, who warned Xi during his trip to Beijing last week that time was "quickly running out" to solve the nuclear crisis, took to Twitter on Thursday to hail the mission as "a big move, we'll see what happens!". A brief report from North Korea's state-run KCNA news agency Saturday morning confirmed Song had landed and met with Choe Ryong-Hae, a senior Pyongyang official and a close aide of leader Kim Jong-Un. The report said Song told his hosts China wanted to "develop the traditional friendly relations between the two parties and countries" but contained no further details of what was discussed. Washington wants China, which accounts for 90 percent of North Korea's foreign trade, to put more economic pressure on the reclusive regime. But experts doubt Song's visit will yield major breakthroughs. "China has virtually no political influence on North Korea. 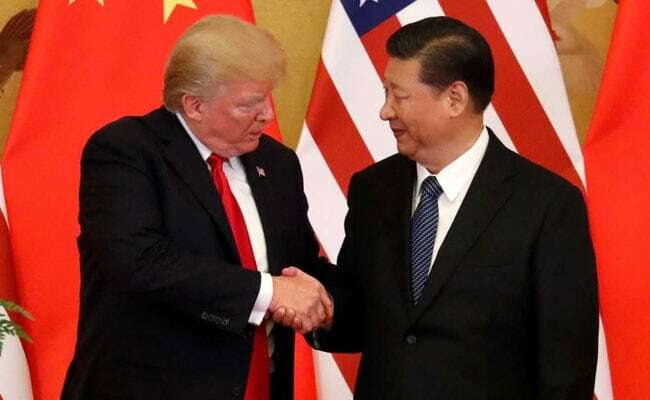 Its influence is derived from economic leverage," Bonnie Glaser, China expert at the Center for Strategic and International Studies in Washington, told AFP. "Relations are extremely stressed. Perhaps the lowest point since the Korean War," she said. "Perhaps (the mission) will put a floor under China-North Korea relations, preventing further deterioration." China has imposed its own banking restrictions on North Koreans in addition to enacting a series of UN measures that include bans on imports of coal, iron ore and seafood from the North. But Beijing fears that squeezing Pyongyang too hard would cause its collapse. Song is the first Chinese envoy to make an official trip to North Korea since October 2016, when vice foreign minister Liu Zhenmin visited. Geng gave scant details about the trip, saying he did not know who he would meet or what topics he would discuss. China's relations with North Korea are currently at "the lowest point they've been in history", leaving the North diplomatically at its most isolated, said Lu Chao, director of the North Korea Research Centre at the Liaoning Academy of Social Sciences. As a high-level diplomat, Song would likely meet directly with North Korea's top leaders, he said. "As far as North Korea is concerned, China's opinion is still an important one and will certainly arouse their full attention," Lu said. As nuclear tensions have soared, Xi has pushed for negotiations and a "dual track approach" in which the United States would freeze its military drills in the region while North Korea halts its weapons programmes. Trump claimed this week that Xi had agreed to drop his plan during their talks last week, but Beijing stood by its policy. "We believe that at the moment, this is the most realistic, feasible, fair and reasonable plan," Geng told a regular news briefing. Yuan Jingdong, a specialist in Asia-Pacific security issues at the University of Sydney, expects little from Song's mission. "We can expect some face-saving, assuring but very general and abstract commitments with no substance changes in North Korea's nuclear and missile programmes," Yuan said. The visit is "more about warning North Korea against going to extremes than forcing it to give up the nukes" because China's top priority remains maintaining regional stability, he said. Song would likely "assure Kim that if he behaves within a reasonable bound he can expect Beijing to continue providing some assistance and resist broadening the sanctions."